Today marked the first daily State Department briefing of the Trump Administration. 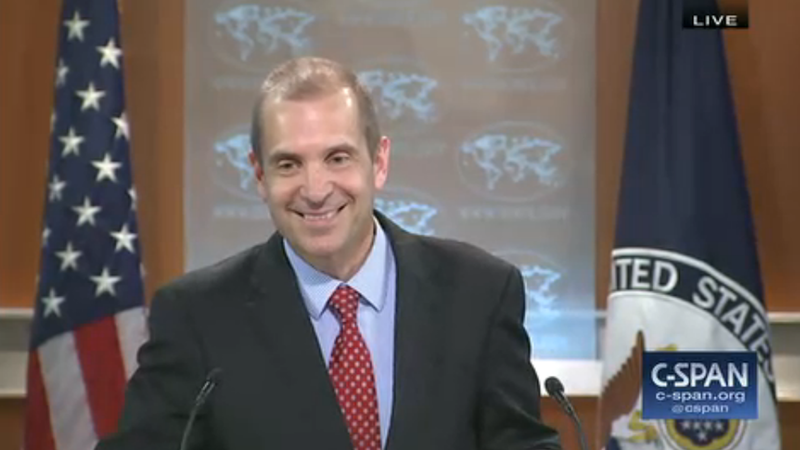 Acting Spokesperson Mark Toner, a holdout from Obama's administration, delivered remarks and said there will be another briefing tomorrow. Tillerson's upcoming travel: Toner reported this week Secretary of State Rex Tillerson will be visiting in China, South Korea, and Japan. On North Korean aggressions: Toner wouldn't say whether the U.S. is considering equipping South Korea with its own nuclear defensive option in light of North Korea's recent threat to the stability of the region. But, Toner said the U.S. told China deployment of THAAD anti-missile system in South Korea is in response to North Korea's aggressions and that it is not a threat to China. On Russian sanctions: the U.S. will keep sanctions in place for Russia until the eastern Ukraine Donbass region and Crimea are no longer occupied. On potential budget cuts: Tillerson is in conversations with people about what their priorities are, and Toner said "the budget process is still … in early days." There will perhaps be cuts, but there will be no limit to the function and efficacy of the State Department. On Tillerson's influence in Trump's administration: the secretary speaks to the president "very frequently" and that Tillerson's voice will be heard "loud and clear" at national security meetings. On Israeli settlements: Toner reiterated Trump's perspective that he would like to see Israel hold back on settlements. He said State is working with the White House to look at the situation to formulate next steps. 1 fun thing: Deputy Assistant Secretary Michael Ratney is taking over the bureau of Middle Eastern Affairs in addition to handling the Syrian conflict. Reporters sarcatistcally joked about that not being too much work for one person.